What makes a particular coin generally accepted as a means of payment and deposit of value? In relatively recent history the answer to the above question has in general been the backing or guarantee either of trusted institutions (fiat money, normally backed by one or more states), or of an asset whose value is agreed by extensive consensus and acceptance (as in the case of gold or other valuable material goods). The key appears to be the general trust provided by an issuer of agreed rigor and quality, or the trust that is deposited in the clear, measurable and shared value that a certain good or asset may possess. So we can agree that the problem comes down to a question of trust. The appearance of virtual currency or cryptocurrency such as Bitcoin aims to question the current state of things in established traffic of money. Now, for reasons such as lack of regulation or apparent ease in use as a deposit for money of dubious origin, Bitcoin and its market are coming under careful scrutiny by the regulators and other competent national agencies, as well as many other qualified onlookers. But it is also true that they are becoming increasingly accepted every day and that companies who can hardly be suspected of involvement in the murky waters of opaque markets (such as Microsoft and Dell) have begun to accept bitcoins as currency for their sales. The complete technology of Bitcoin is, in general terms, a structure made up of two different entities that are complementary: the currency itself (which has to comply with the ordinary functions of any currency as a means of payment and custodian of value) and the software infrastructure, called the “block chain“, which supports the “general ledger” of each and every one of the bitcoin units from their respective creation and that records all the possible exchanges (transfers) to which they have been subject. Due to its fundamentals, its apparent robustness, and its possible application to other areas of real life (including, for example, support infrastructure in financial markets, public trust, property and transaction registers…), the block-chain technology is arousing interest among different traditional operators, who see potential added-value applications. This technology that supports other virtual currency apart from Bitcoin is of great interest as it means a change in the paradigm of support that can be provided by fiat currency, which no longer comes from a centralized authority, but through a completely decentralized peer-to-peer structure (a network in which there are no hierarchical servers and the tasks are divided into equivalent nodes), capable of guaranteeing the historical record of all the transactions and a final coherent and reliable final status for the whole system. We are not going to talk a lot about the Bitcoin situation and applications, for which material is already easily available. This article is interested in the concept of trust applied to the acceptance of cryptocurrency. There is no better way than to try to relate its acceptance to the forms of guarantee used to introduce the article. We know that Bitcoin is not backed (as the euro and the dollar are, for example) by a number of states and official bodies depending on these states, which provide both a physical structure (the monetary and financial systems) and convictions that are more related to mental states such as security and comfort, in its use and storage. We also know that the Bitcoin support infrastructure is of an informational nature and it is distributed into thousands and thousands of nodes (around one million early in 2014). 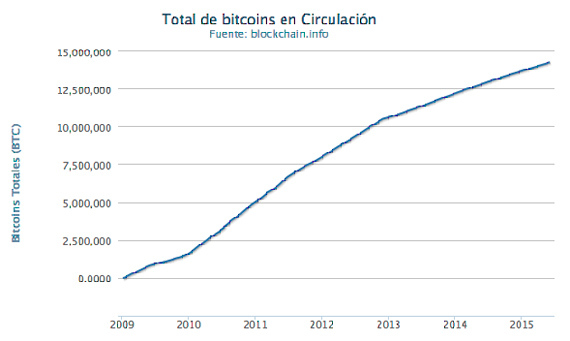 There is no central authority that backs cryptocurrency, but its extension, its public and disruptive nature, and the apparently solid cryptographic foundations of its infrastructure has generated sufficient trust to maintain as of today over 14 million bitcoins (Chart 1) valued at current rates (mid-2015) at some 3.5 billion US dollars. 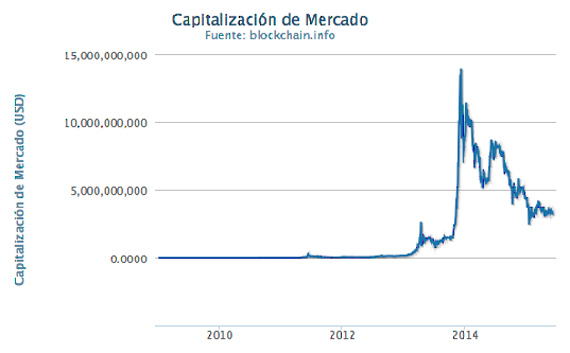 This is far from insignificant for a virtual currency that is only five years old. If to the above we add 3 million bitcoin wallets so far, the approximately 60,000 retailers who accept them, more than 350 ATMs that can exchange them, the steadily growing admission of bitcoins by major multinationals, as we have mentioned (above all, though not solely, in the technological sector), it would appear indisputable that there is at least a certain significant level of acceptance and trust with respect to the currency. But let’s go into a little more detail about the solidity of this trust with some additional points. In accordance with what we have just seen, and just as any currency that is worth its while, Bitcoin is traded against others. It is interesting to see that at the end of 2013 the value in dollars of the total mass of bitcoins was nearly 14 billion, a huge leap from prior values of around 1.5 billion dollars two or three months earlier. However, in June 2014, a year ago, the resulting value was 8.5 billion, and as we have seen its current value is around 3.5 billion (Chart 2). Market activities in the last year and a half have meant, as can be seen, a severe depreciation in the cryptocurrency, a general trend which is unlikely to be corrected. It may be too soon to conclude whether it is a process of relatively violent depreciation that will end with a practically zero value for this currency, or whether it is an adjustment to more reasonable values from irrational highs. We will see. Meanwhile, we have already noted that major multinationals are accepting bitcoins as currency for payments. However, it is important to point out that everything points to their use as a means of payment with immediate conversion to classic currencies. It doest not appear that its administrators are for the moment happy about the large amounts of money in circulation denominated in bitcoins, above all after the major oscillations in value that we have just pointed to, or after some frights caused by losses suffered by operators such as Mt. Gox at the start of 2014, and whose causes are still not very clear. How to conclude this point? Does what we have seen make it reckless to guarantee the existence of complete trust by operators in the Bitcoin system? Or, on the contrary, is it reasonable to assume the contrary position and depreciate the currency? An intermediate and wait-and-see position, perhaps? Maybe some additional arguments referring to the presence of an valuable asset behind the cryptocurrency can help to explain the question. What we will deal with now is one of the most interesting aspects of the Bitcoin currency, and it is an intrinsic part of its existence. It also corresponds to the mechanisms where the traditional operators expect to find potential applications. It is how the substratum of all the Bitcoin mechanism works: the block chain. Finally we will see how a bitcoin unit is generated, where it comes from and who makes it. To sum up what I will say, this origin is intimately linked to remuneration for backing to the currency in the peer-to-peer network. In order not to make this article excessively complex, we have prepared a second part or annex where we go into details about the most important mechanisms of the block chain, as well as in some of the technologies needed to have a better vision of the problem. These are subjects we will only touch on lightly in the main article. We know that information exchange on any IT network, and therefore on the Internet, must be accompanied by security mechanisms that ensure that the information transferred can only be read by the addressee, even though the physical message may be captured by third parties. It is also important to ensure that the sender of a certain document is really the person he says he is. These objectives are normally complied with through encryption of information and with the digital signature, linked technologies to which we provide a very brief introduction in the annex to the article. The designers of Bitcoin define the currency as “a chain of digital signatures”. Each transaction (or, for our purposes, each title of ownership) is like a certificate whose content is linked to the transaction and the previous owner, as well as the new owner. All this information is signed digitally by the owner making the transfer. The coin is defined by the links of all the transactions carried out with the same coin (or fraction or combination of them) within what is called the block chain. The chain provides information on the new owner of each transaction and each owner has to trust that no forger can modify the block chain and thus question the final ownership of each coin. The mechanisms needed to guarantee this are not trivial (see annex). For the purposes of the rest of this article, it will be enough to consider two important points. First, that these processes are what provide the foundation for the existence of the whole peer-to-peer network that supports Bitcoin – or, to put it more precisely, the network that supports the block chain that supports Bitcoin. Second, and now we are coming to the core of this final part, the main security mechanism of the signature chain (i.e. of Bitcoin) is based on costly computational work designed in such a way that it makes forgery of the chain unfeasible. The basis of this unfeasibility lies in the statistical competition against all the rest of the honest peer-to-peer network, which in the last resort means the probability that a possible forger can be successful is negligible for all practical purposes. This computational work, termed Proof-of-Work or PoW, is linked to the addition of the new blocks (that combine different transactions carried out in a determined period of time) to the block chain. It is the equivalent of guessing the combination of a padlock that allows us to link the new block to the last block of the chain. This work is rewarded if you can do it before anyone else. That is who some nodes in the network, called miners, compete to be the first to open the computational padlock. How is success in this work rewarded, given that it requires the use of resources such as electrical energy, time, amortization of hardware…? With new bitcoins, as well as possible small fees per transaction. Currently the successful mining node receives 25 bitcoins per validated block (around 6,000 dollars). As the system is designed in such a way that one block is added to the block chain about every 10 minutes, after a day some 3,600 new bitcoins will have been generated, around 850,000 dollars in exchange value (approximately). However, this reward will be reduced over time until an asymptotic limit is reached in the creation of new bitcoins. This creation will be increasingly spaced out until it disappears due to lack of compensation. As an additional effect, it is argued that this will prevent bitcoin inflation. The maximum number of bitcoins will be around 21 million, of which 14 million have already been issued. This is the form in which new coins will be generated and added to existing ones. After their creation, each new coin, owned by the node that has resolved the block problem, is subject to the registration and transmission procedures we have just seen. The argument we usually find in the documentation on Bitcoin is simple. The high value of, for example, gold is due to its scarcity and the difficulty of finding new material. If every time we stepped through a field we were stepping on gold nuggets, its value would be practically marginal. So something like a bitcoin, whose regeneration is complex and involves a significant use of resources, must also be valuable. We could say that we are faced by the gold standard of the Bitcoin system: the equivalent or proportional asset to the consumption of resources that serves to sustain its very existence, given that it is a guarantor of the security of the whole chain of ownership. What we have tried to do is review the fundamental aspects of the cryptocurrency in terms of trust, also introducing the special objective valuation of the work standard that underlies the Bitcoin system, not with an excessive level of details (see the technological annex) but sufficient to allow a reflection on its reasonableness. In the last resort, the aim is to give some idea about whether Bitcoin will end up imposing itself as a trustworthy currency or whether it will disappear, or perhaps adapt its fundamentals, after some years of a turbulent and interesting existence.